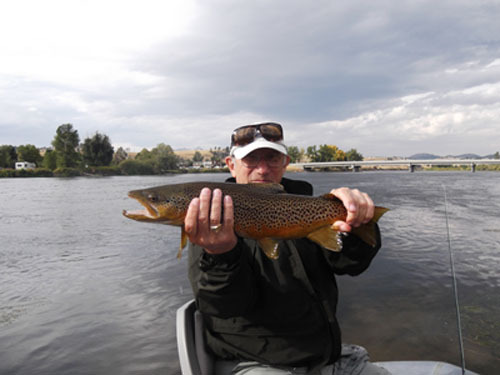 Montana offers some of the best fly fishing waters to be found anywhere. You can fish 6-8 different rivers in a week –the Missouri, Big Blackfoot, Little Blackfoot, Clark Fork, Dearborn, Clearwater, and Bitterroot Rivers –or stay with one of these spectacular rivers all week long and never fish the same stretch twice. It doesn’t get any better than Montana fly fishing here in God’s Country, simply world class! We provide 1 day outings, multi-day trips, and custom tailored extended trip packages that include both fishing & camping. When is the best time to come? Because June and July are typical “vacation” months, they are also the months when more people are on the rivers. April through October is optimal in terms of weather, but remember: fish feed year round, and with so many rivers to choose from, there is always good fishing to be found somewhere nearby. The Big Blackfoot River, made famous in the movie “A River Runs Thru It,” is a gravel bottom, boulder-strewn “Freestone” river running from the Continental Divide near Lincoln, down thru the Blackfoot Valley where it joins the Clark Fork River at Bonner, Montana. This is one of the most beautiful, scenic rivers in Montana and it is hard to keep your eyes on your fly when you’re surrounded by breathtaking scene of pine forests and towering cliffs. And the fishing? Awesome! Our guides know it like their own backyards, and know how to help you get these powerful fast-water fish on the end of your line! Even first time beginners enjoy great success, as the aggressive West slope Cutthroat is not as finicky as some trout. The prolific hatches of huge Salmon Flies, Golden Stones, big Mayflies, Caddis, and a smorgasbord of terrestrial insects work these opportunistic feeders into a fly-grabbing frenzy. Most fishing is done from a raft using big dry flies on a short line in fast, broken, gin-clear water filled with Westslope Cutthroat, Rainbows, Browns, and the huge Bull Trout, better known as Dolly Varden. Enough can not be said of the beauty of the Big Blackfoot and the quality of this fantastic fishery, and the level of knowledge and experience our guides have on this pristine freestone river. 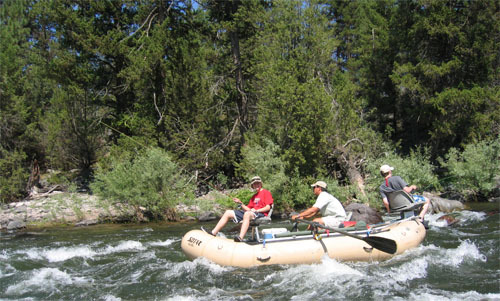 Read more about the Blackfoot here or contact us today to join us on the river! The “Mighty Missouri” is a “must fish” river for experienced anglers where stealth and delicate, accurate casts with tiny match-the-hatch dry-flies that compete with thousands of the real bugs, and a drag free drift are required to catch the huge, wary and finicky Rainbows and Browns rising to Caddis, BWO’s, PMD’s, Trico’s, midge, and a wide array of terrestrials. When there are few, or no fish rising, nymph or streamer fishing is hot from a drift boat or raft. When flows are low-moderate, there are lots of wade fishing opportunities. We fish the Missouri from Holter Dam to Cascade, a 30-mile stretch of river designated a “Blue Ribbon” tail water fishery. Read more about the Mo’ here or contact us today to join us on the river!